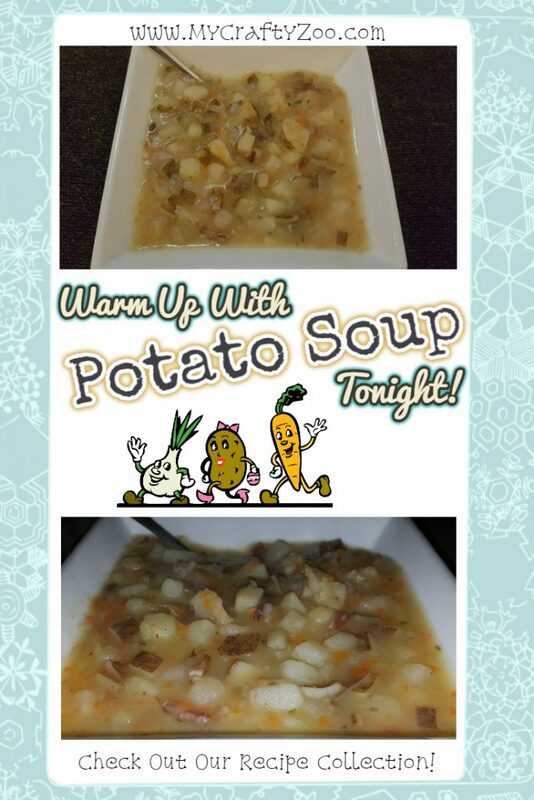 Potato Soup is fantastic, especially on cold winter nights! Coming out of the holidays, it was a good break from leftovers! Having something filling to warm up on cold nights is wonderful! 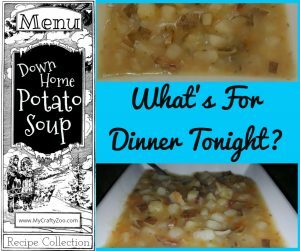 This recipe for Potato Soup can be made with or without dairy, you are sure to love it! This recipe is quick and easy but if it isn’t fast enough for you it could be made ahead of time. Not enough time to do it ahead of time? Buy the veggies pre-prepped! There are always shortcuts! Be sure and check out our other recipes! Mixing it up in the kitchen is definitely a requirement around the Zoo! My favorite tip: prep your own then freeze them on a non-stick cookie sheet! Put them in baggies and they’ll be ready to go when you need them! Plus, it’s healthier and easier on the budget! Cover potatoes, onion, celery, and carrots with water. Cook until boiling, then lower to a simmer until potatoes are tender. While pot is boiling, cook bacon until almost crisp, crumble and set aside. Add bacon, parsley and butter to simmering potatoes. Combine 1/4 c flour OR 4 Tbsp corn starch (adjust as needed) with milk or beef stock. Mix well. Add mixture to soup for thickening. It will thicken as it cooks, but if you feel it needs to be thicker, take some of the liquid and mix more flour/corn starch in then add back to soup. If it gets too thick, add water! You got this! Let simmer until good and creamy. Enjoy! Since part of the household can’t have dairy, and part can, ours was made non-dairy. So, to get my dairy in, I added ranch dressing and it was out of this world! I’d love to hear how you make it your own! Let us know in the comments!